Are your testicles shrinking in size? If so, you need to take action now! The sooner you attack this problem, the higher your chances of success. Why are my testicles shrinking? I've found that for men under the age of 50, these are the most common causes. Excess alcohol will cause your testicles to atrophy. Regular binge drinking will make the problem worse. It's OK to blow it occasionally, but more often than not , you should limit your alcohol consumption to 2 or 3 drinks per day, depending on your body size, and ability to handle alcohol. Men who smoke marijuana frequently have less seminal fluid, and a lower total sperm count compared to men who don't smoke. This often leads to smaller testicles, and reduced levels of fertility. Steroid use causes the suppression of natural testosterone levels, which reduces production of sperm. Since much of the mass of the testes is made up of developing sperm, this causes a reduction in testicle size, or testicular atrophy. Follow the link above to learn how to reduce your estrogen load. There are so many medications out there that can cause hormonal problems in men it would be impossible to list them all on this page. If you are taking any type of drug, this should be the first thing you look at when trying to get to the root of your problem. Here is a very short list of some of the worst offenders..
You have two choices you can make now. You can either try and medicate your problem into oblivion, or you can get to the root of the problem. Medications, hormone replacement therapy, and other blunt force methods always come with side effects. They can also be very expensive over the long haul. Remember, many of these treatments will shut down your natural testosterone production, so this can be a lifetime commitment. It's much better to get to the root of the problem. 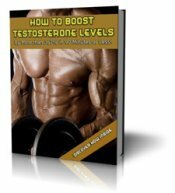 Once found, eliminate it, then get to work on boosting your testosterone levels naturally. The end result will be bigger fuller testicles, and a much higher quality of life. How to Develop Huge Testicles!